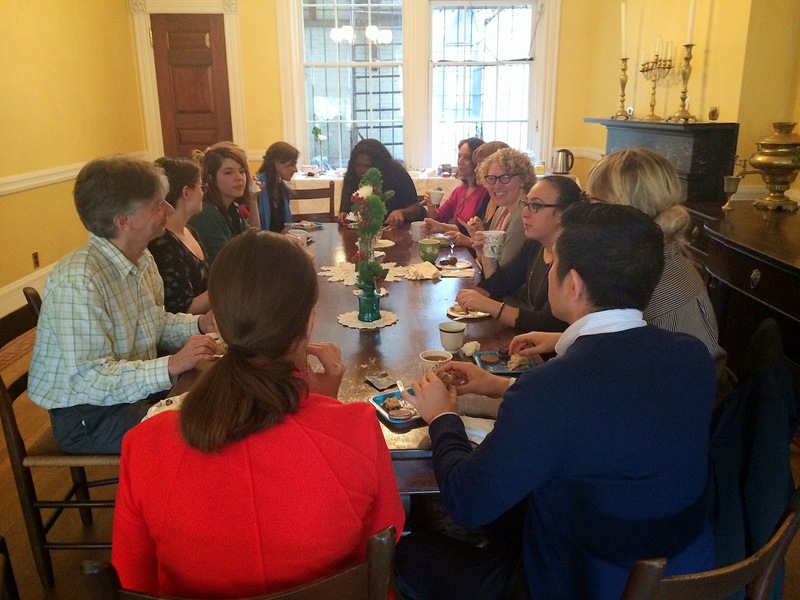 At work last week, my colleague Allison (aka a Mennonite in Manhattan) was treated to a high tea birthday party in Henry Street Settlement's historic dining room. 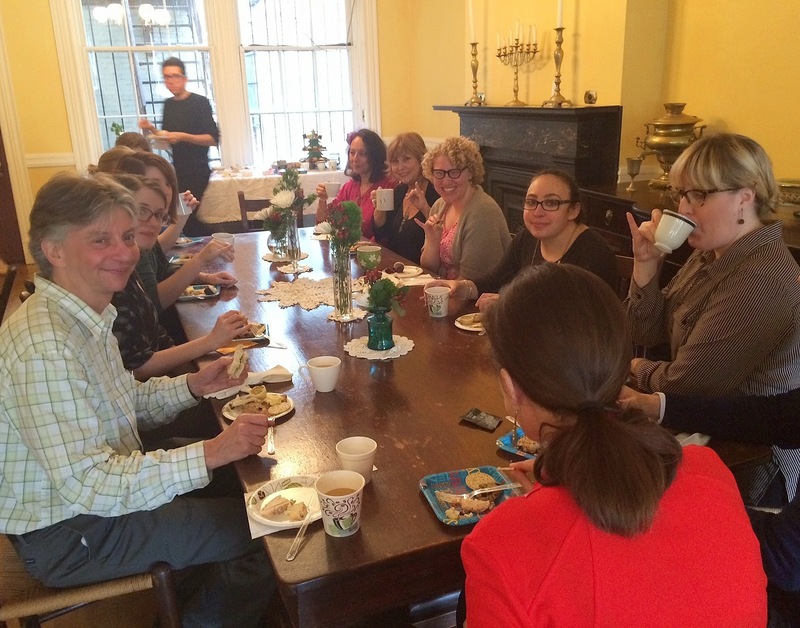 There was quite the spread -- fancy teas and finger sandwiches and small cakes. I was asked to bring scones. And so I did, even though they did not come out as lovely as I'd hoped. 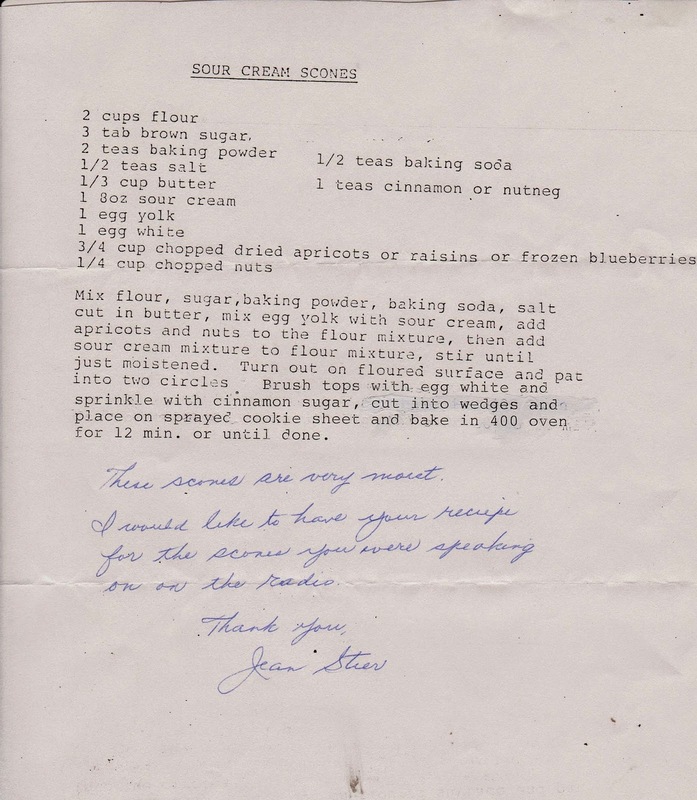 The recipe for sour cream scones was in the collection I received recently from Arthur Schwartz. 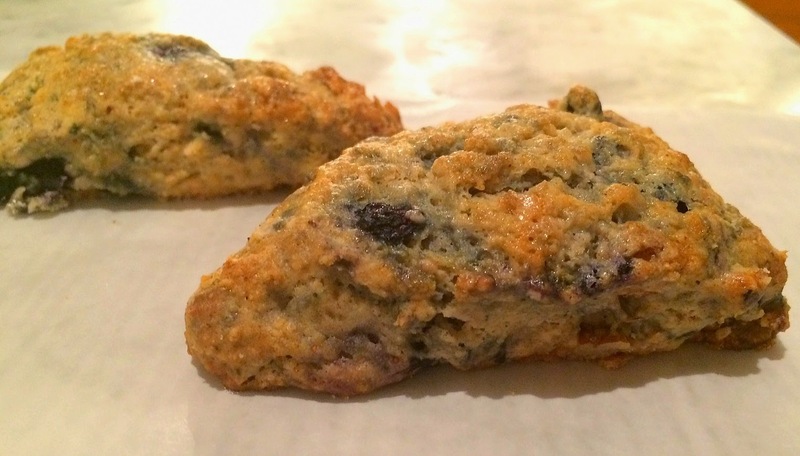 They were full of promise ("These scones are very moist," wrote the recipe's contributor.) I found that the dough was too moist to work with, though the end result was pretty good (if not very pretty). 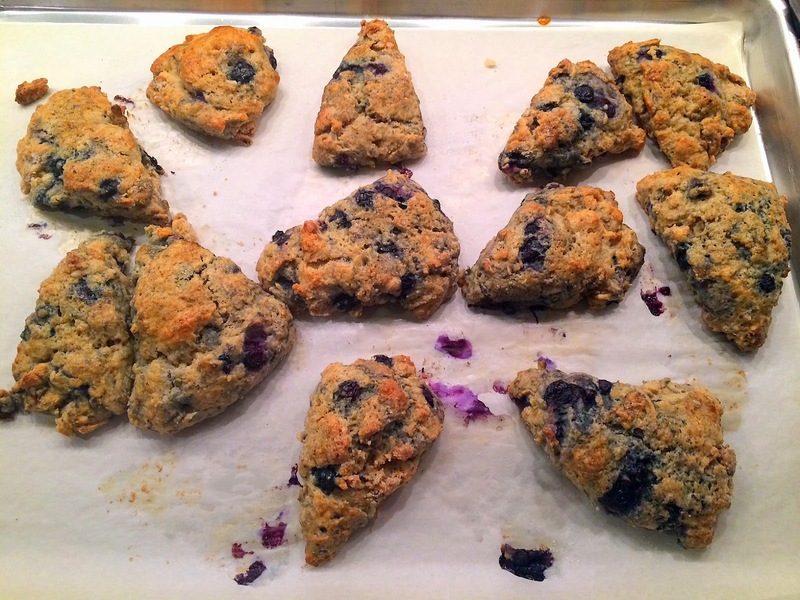 Despite competition from a lot of tempting buffet items, the scones were gone -- everyone liked them! 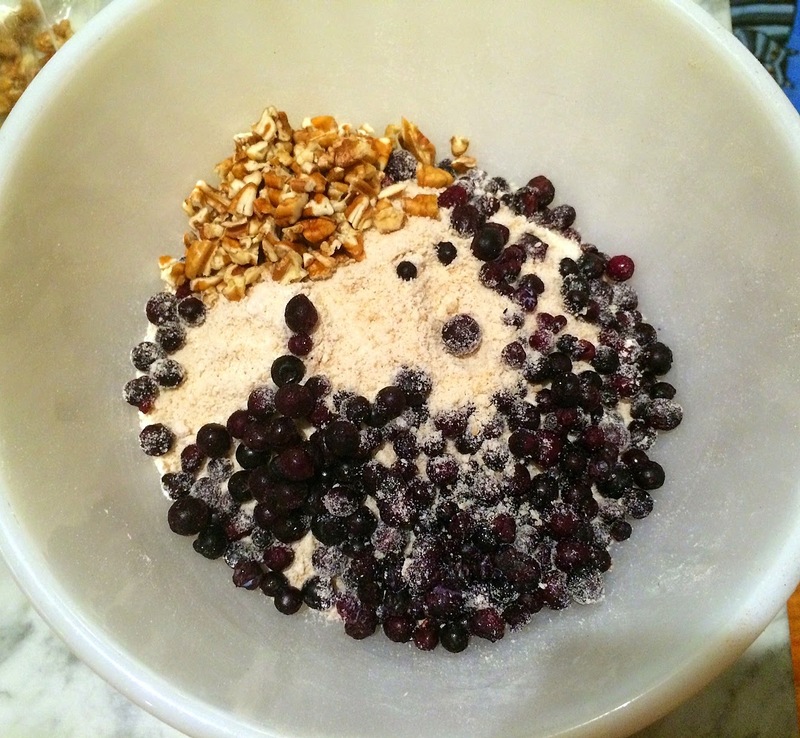 Start by combining the dry ingredients in the bowl of a food processor. Add cold butter and process until it's incorporated. 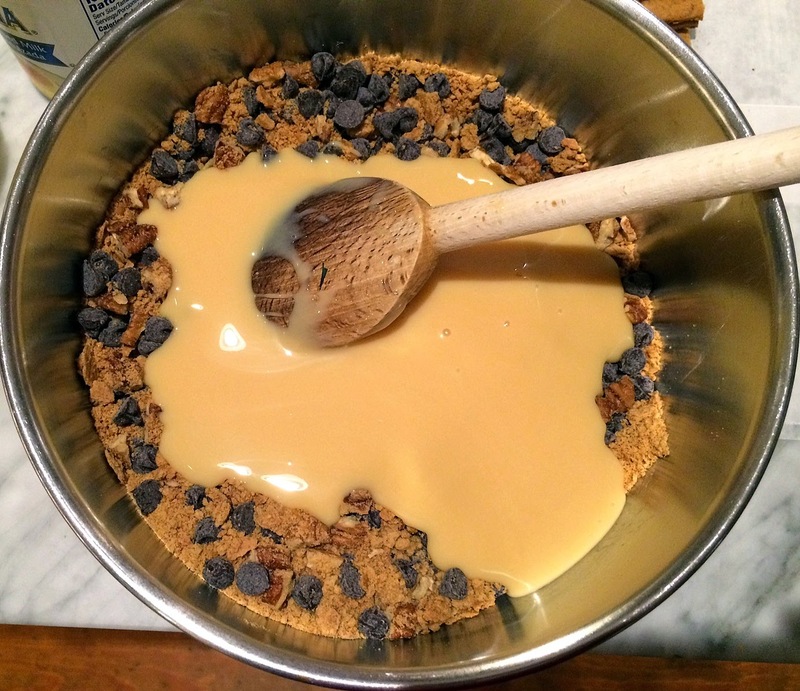 The mixture should be crumbly. 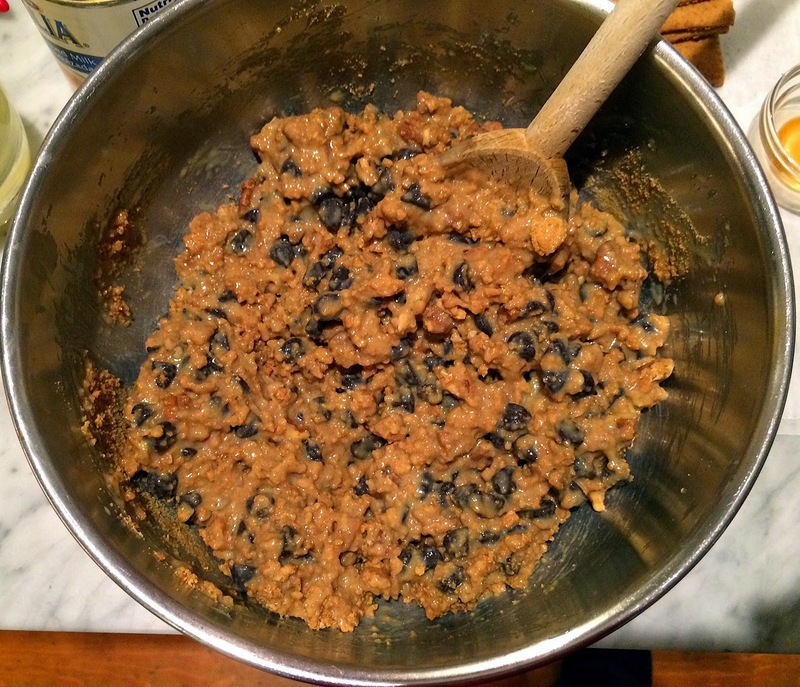 Transfer it to a large bowl, and add in the nuts and blueberries (or dried apricots or raisins). 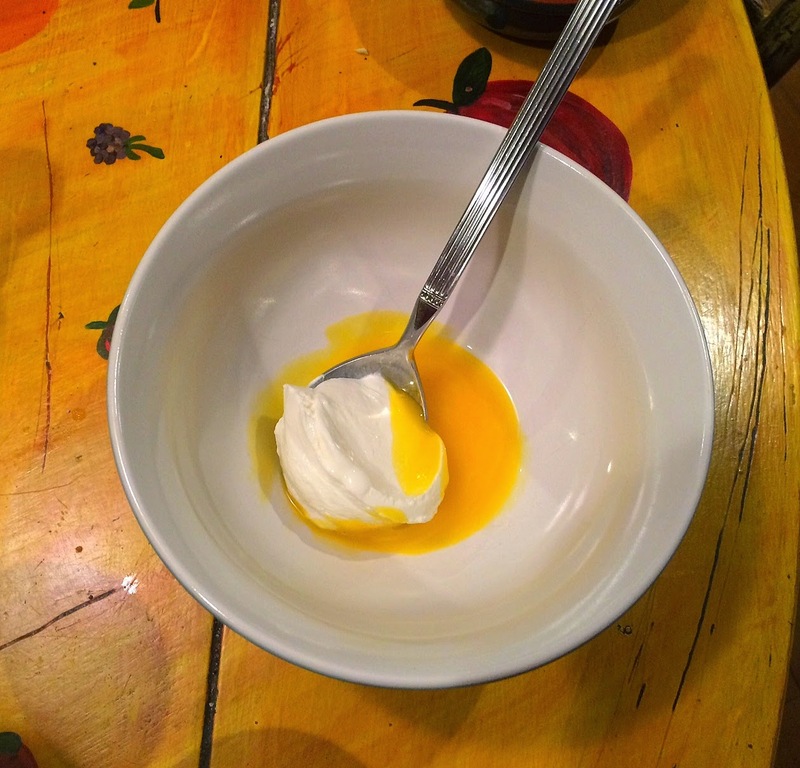 Meantime, mix the egg yolk with the sour cream. Now, the "fun" begins. 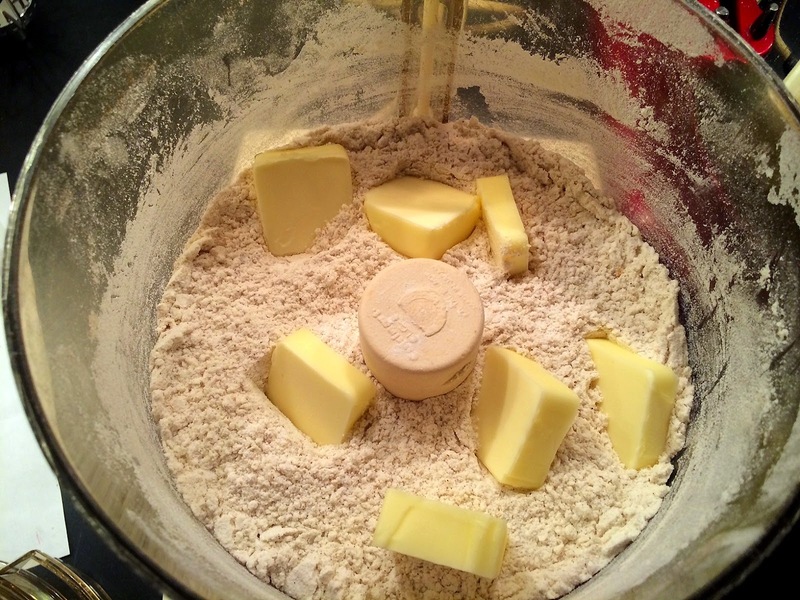 As you can see below, the batter is difficult to work with, i.e., simultaneously too wet and too crumbly. But I persevered; it was late at night and I hadn't the time nor energy to start over. I cut the rounds into wedges, brushed the tops with egg white and sprinkled on sugar, said a prayer and popped them in the oven. Production notes: I followed this recipe exactly as written. 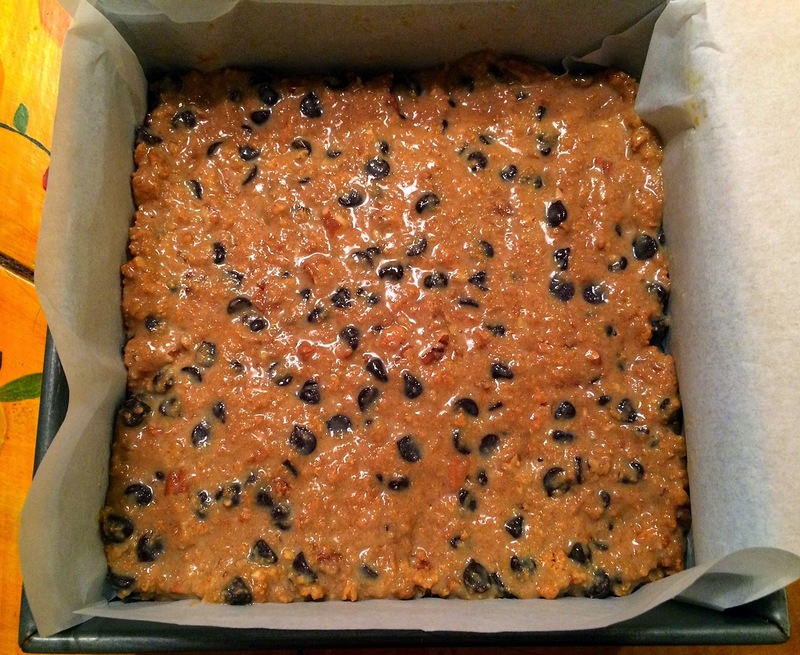 This would work better with the apricots or raisins -- I think the blueberries added too much moisture to the batter. Below is the high tea birthday party. The birthday girl is on the right, smiling at the camera. Can one improve on tradition? Or at least tweak the expected? Yes, we can! If you're looking for a pecan pie alternate, but still want to give a nod to Thanksgiving tradition, then this Pecan Crunch Pie may be just the ticket. This unusual dessert is a meringue enriched with nuts and graham cracker crumbs, and topped with a layer of whipped cream. 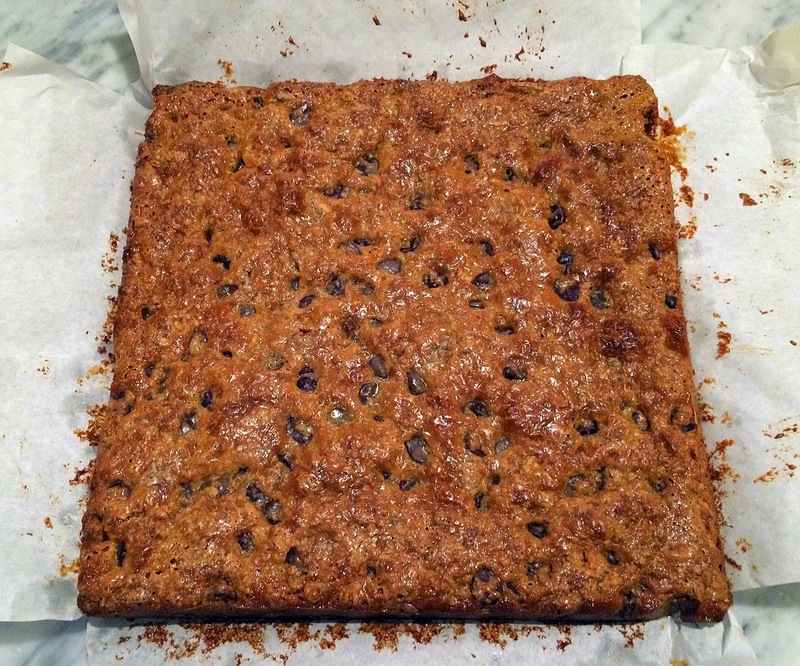 It's pretty darn good and contains no butter (if that's your thing). 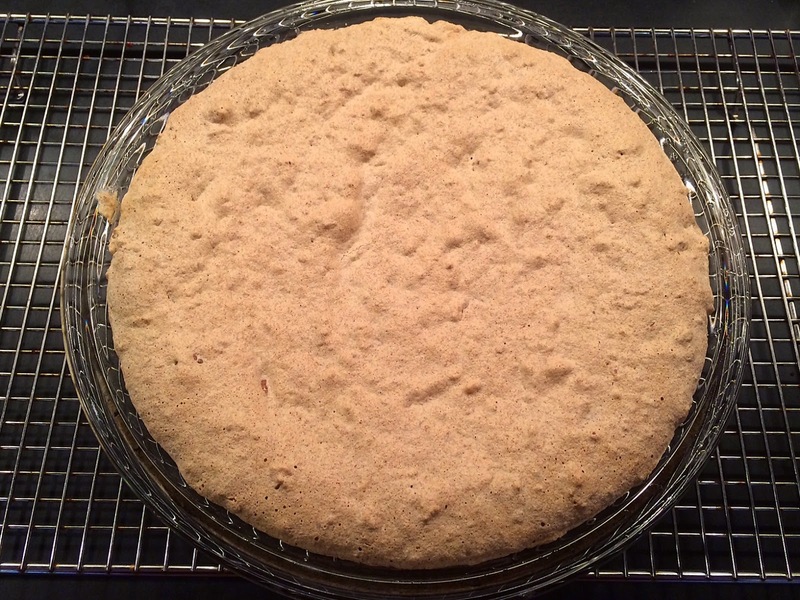 This is a sweet pie (from a vintage Texas family recipe) and quite addicting (even if you've sworn off dessert). Is this easier than traditional pecan pie? I'd say it's a toss up: It doesn't require making a pie crust, but it does require whipping egg whites. 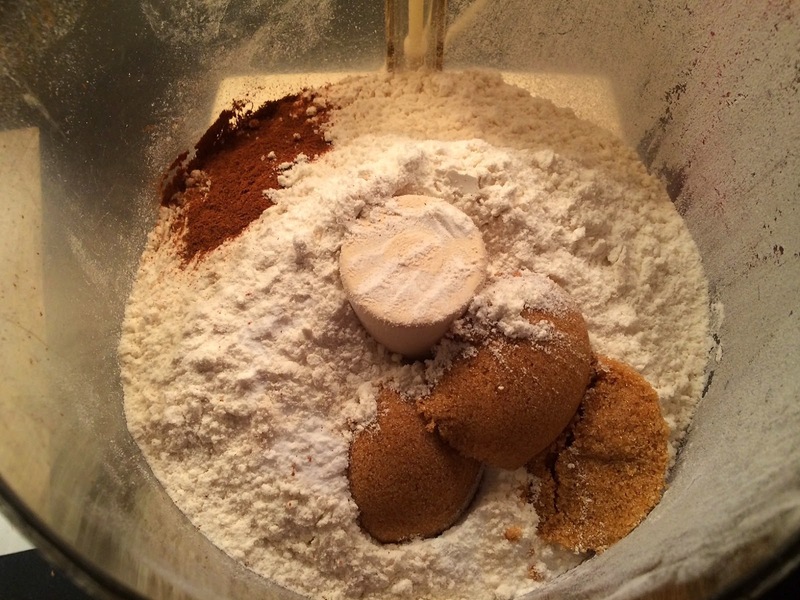 Start by crushing the graham crackers, which can be done like this, below, or in a food processor. Chop the nuts. 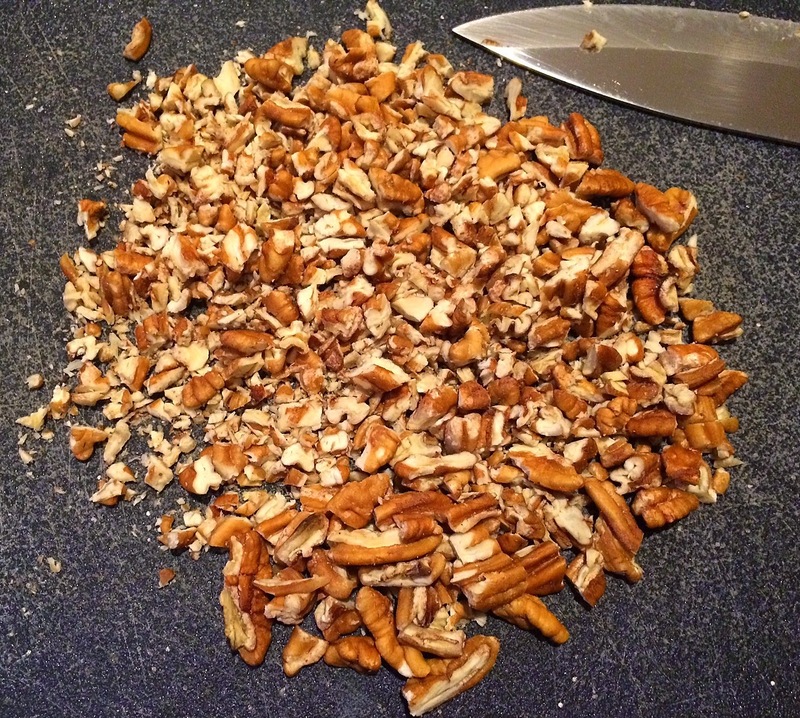 I used pecans but walnuts would also be nice. 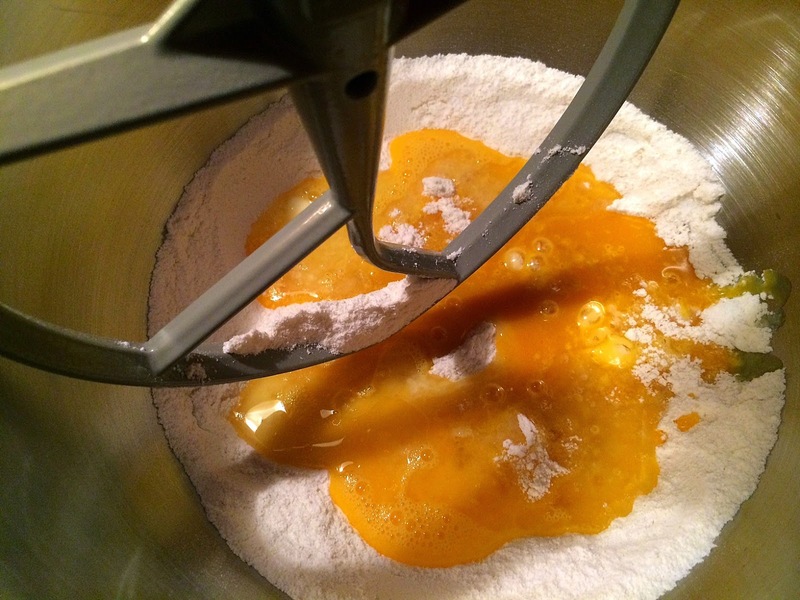 Whip the egg whites (use an electric mixer for this), and add in the sugar gradually until the mixture is thick, glossy and holds a peak when the beater is lifted. Be sure your egg whites, the bowl and beaters are completely clean and grease-free; if not, your whites won't whip. Carefully fold in the graham crackers, nuts and vanilla. 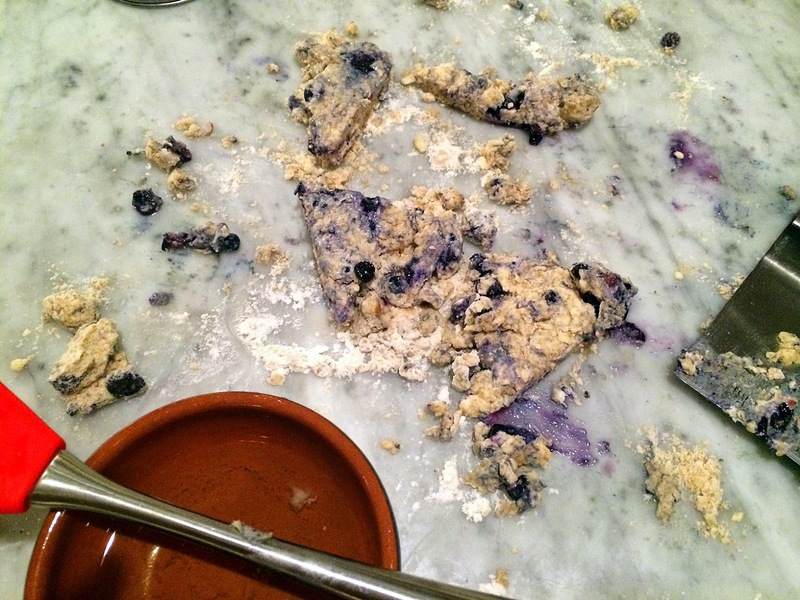 Turn the mixture into a well-greased pie plate. Spread evenly. Bake for about 30 minutes until golden brown. The meringue will be firm. 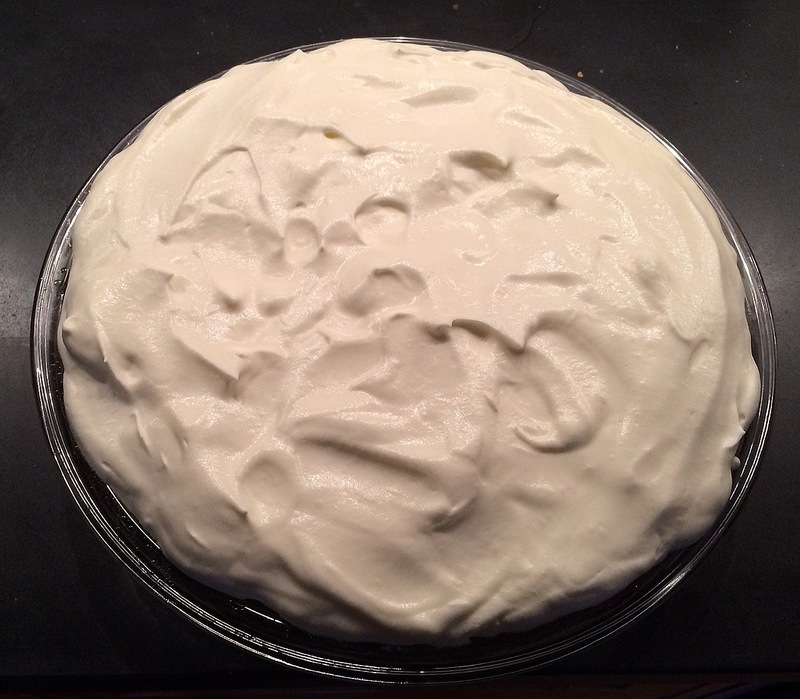 After the pie is completely cool, whip heavy cream, with or without adding sugar, and cover the pie entirely. 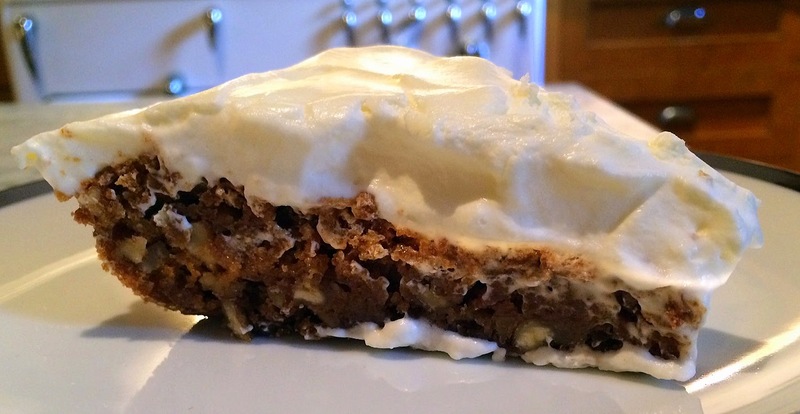 It's better to whip the cream until fairly firm for this pie. Whipping cream is easier if the bowl and beaters are very cold -- just pop them in the fridge or freezer for a while. 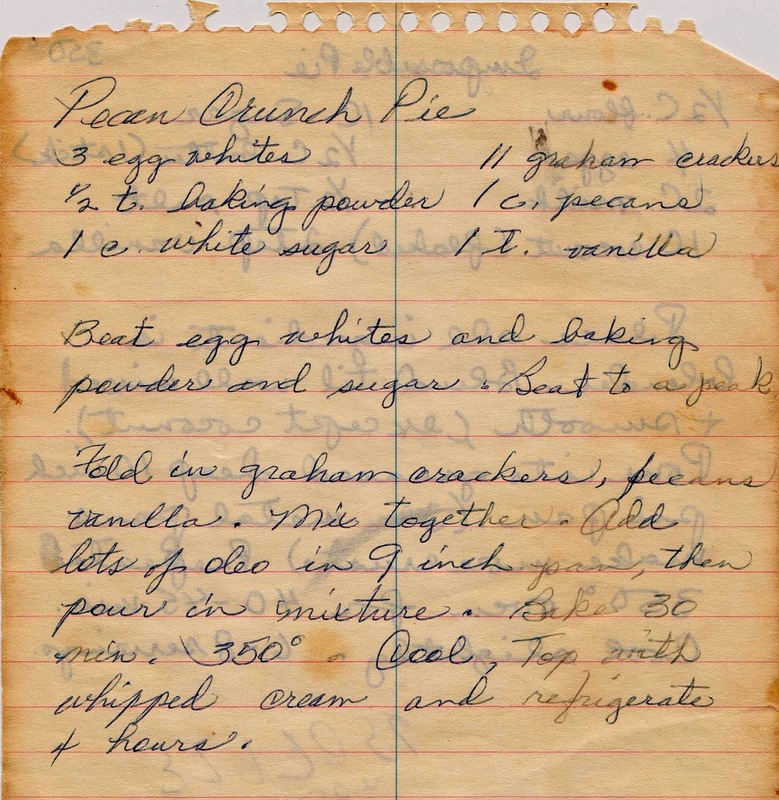 The original recipe is below, but because it's difficult to read (a recipe for Impossible Pie is on the reverse), I've written out instructions below. Preheat oven to 350 F. Grease a nine-inch pie pan. 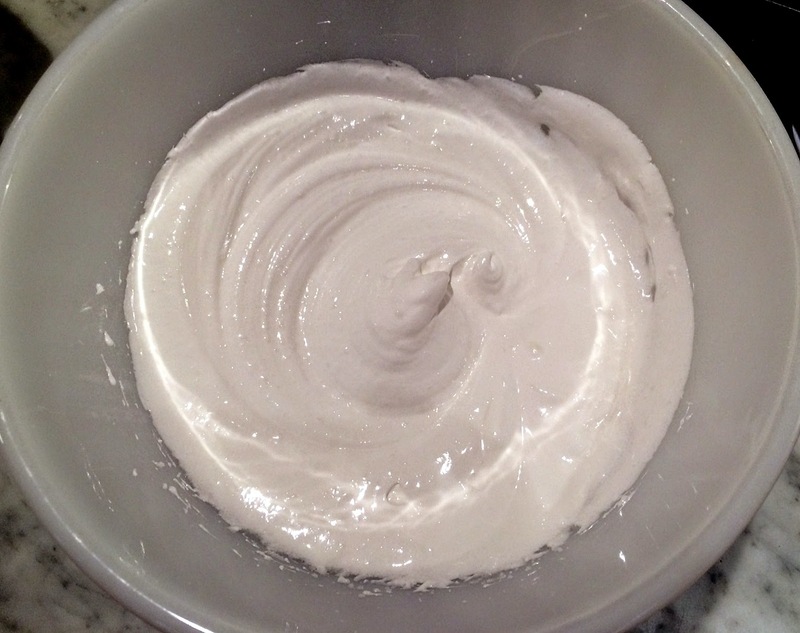 Beat egg whites with baking powder. 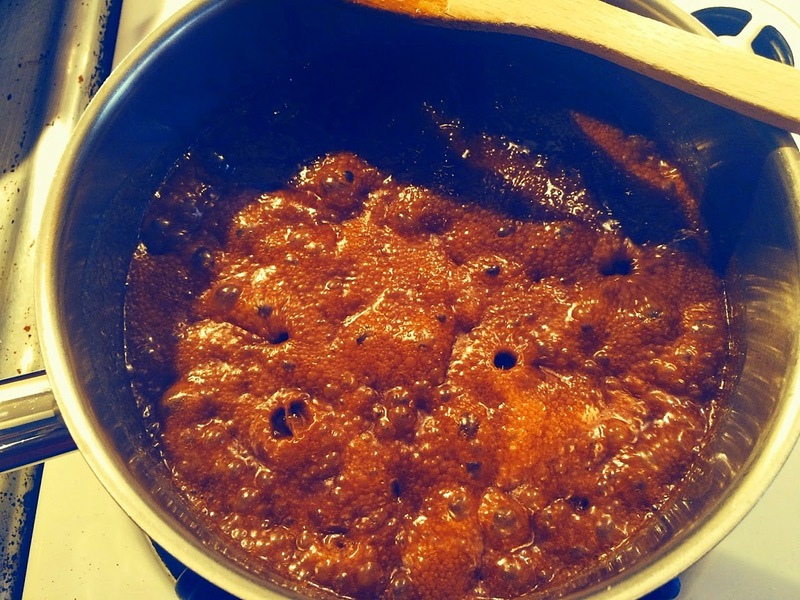 Slowly add sugar and beat until the mixture is thick and forms a peak when the beater is lifted. 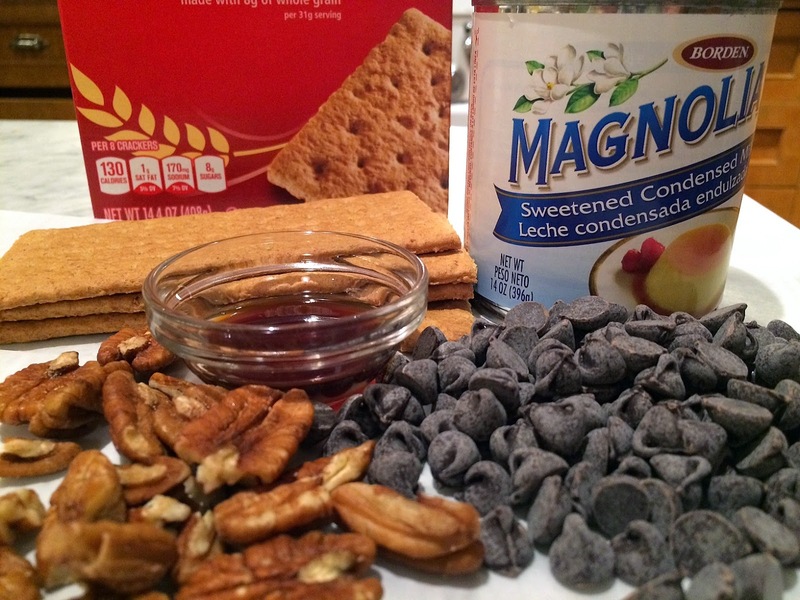 Fold in the graham crackers, pecans and vanilla. The batter will be quite thick. Spoon into the prepared pie pan and spread evenly. Whip cream until firm peaks form. You can add in some confectioners sugar if you want the topping sweeter. Spread evenly over cooled pie. 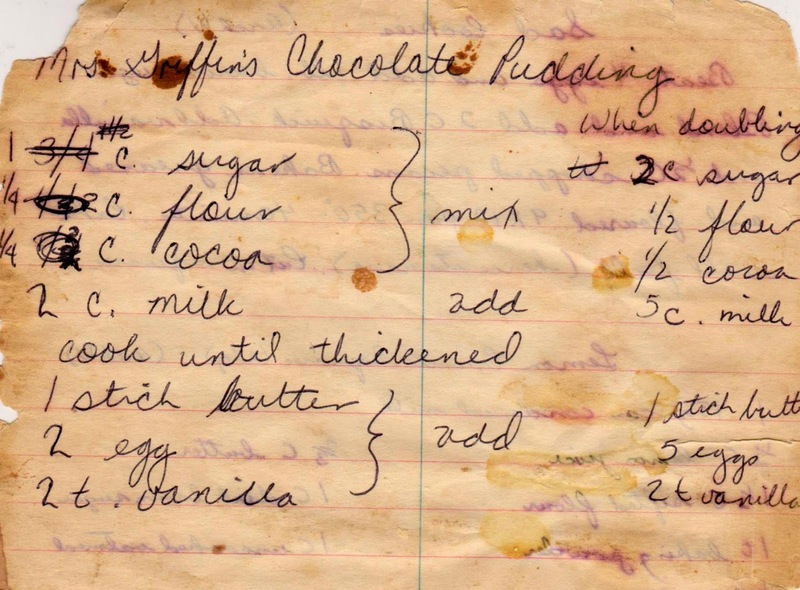 Remember that chocolate pudding your mother used to make? Yeah, this is it, but better, especially if your mother (like mine) made chocolate pudding from a box. Despite being raised on instant pudding, it is still my weak spot. Even when I swear I'm not getting dessert in a restaurant, if any type of pudding is on the menu, my resolve disappears. It is the ultimate comfort food. 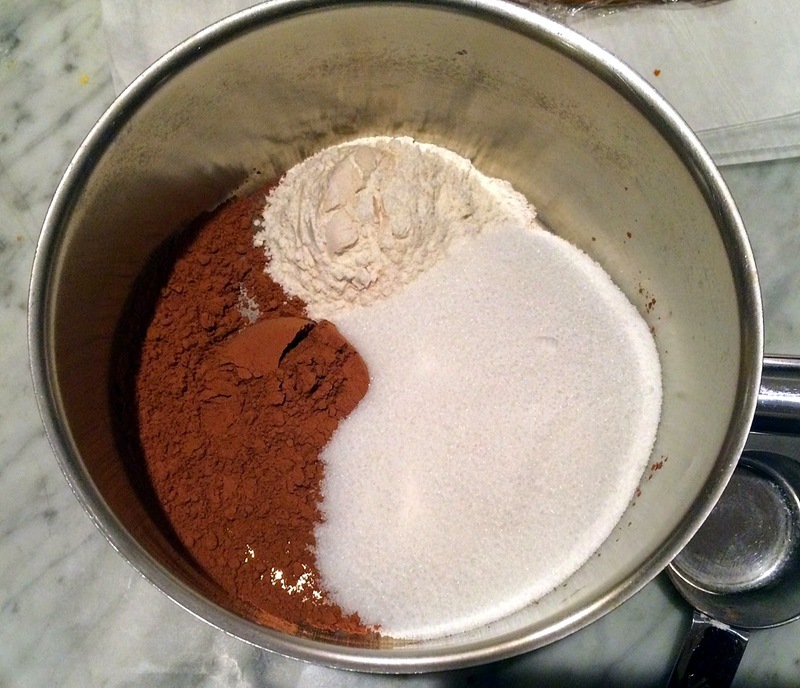 To do it right, combine the dry ingredients -- flour, sugar and cocoa -- in a saucepan. Blend them together first (I didn't) and add the milk. Add in the tempered egg mixture (instructions below), cook until thick and then add in the butter. If you fail to temper the eggs as I did on my first try, you can still save the pudding by putting it through a sieve. 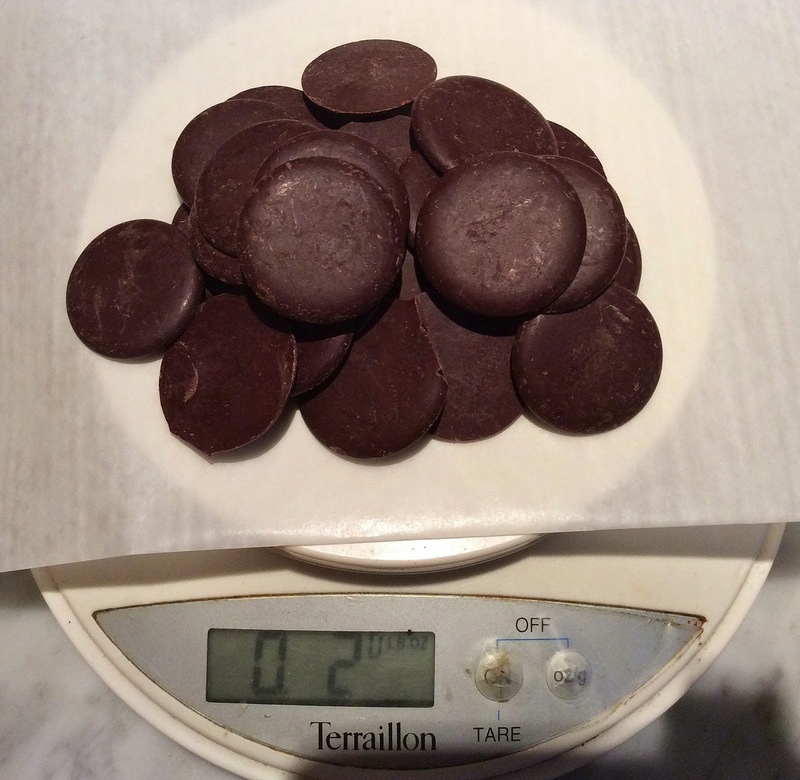 Those solid bits below are scrambled eggs -- something you definitely don't want in chocolate pudding! My first attempt, and the subsequent "save the pudding" attempt, albeit successful,left quite a mess. 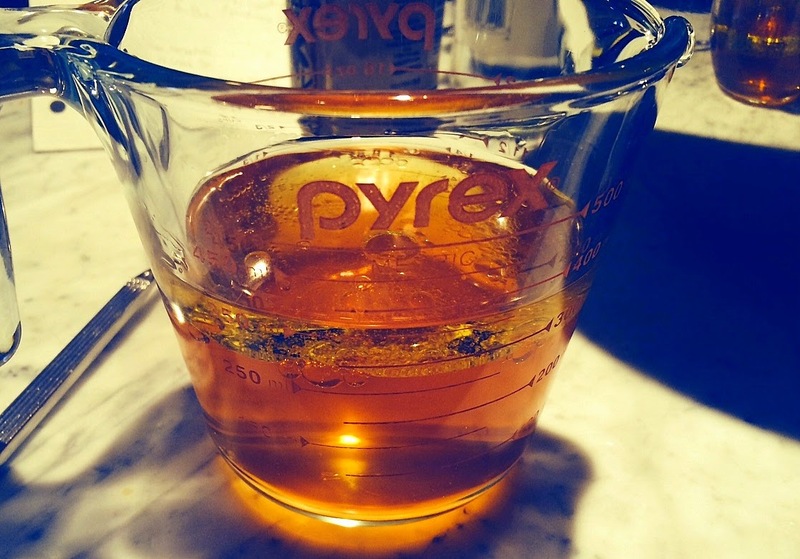 Production notes: Because the recipe is so vague, and to save you the fate I faced the first time I made it, I've written out more detailed instructions. 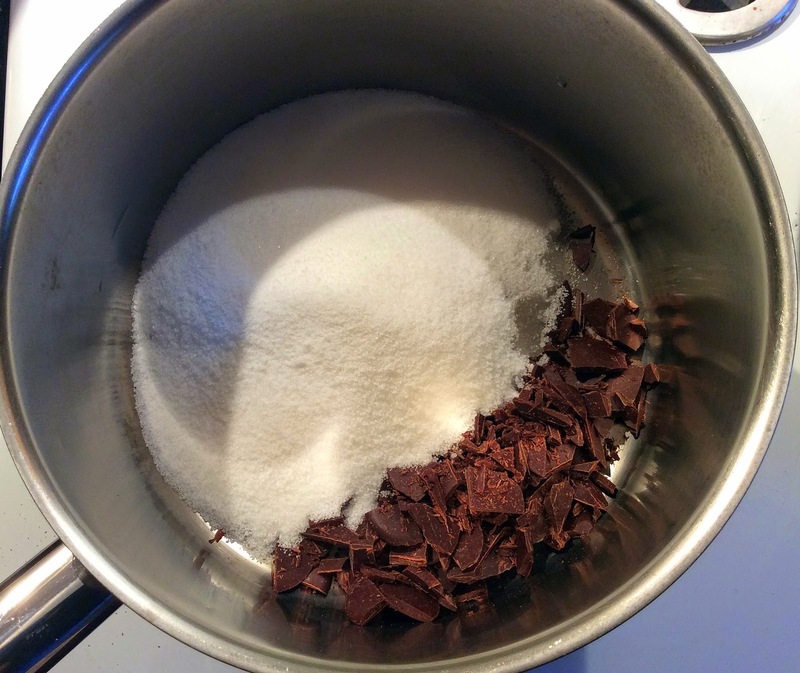 In a two-quart saucepan, combine sugar, flour and cocoa. Add 1 1/2 cups milk and cook until slightly thickened, stirring almost continuously. 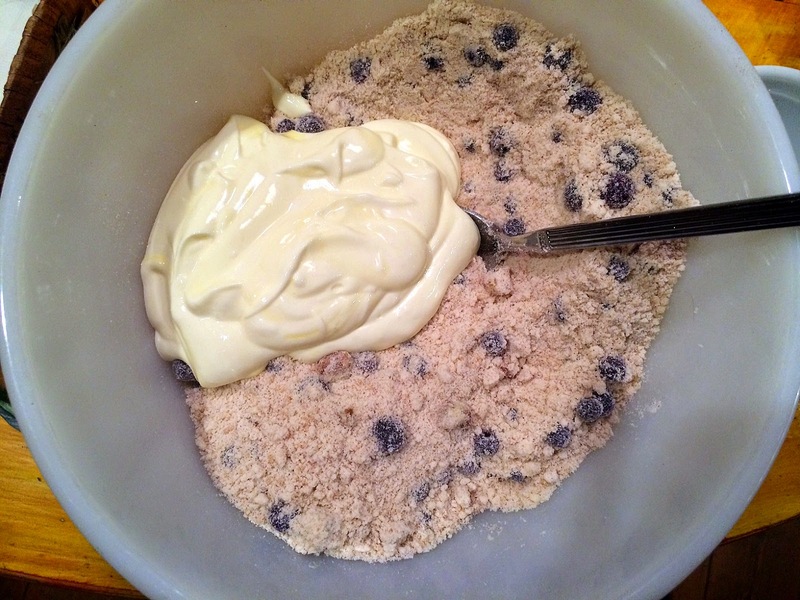 In a medium bowl, beat the eggs and add 1/2 cup milk. 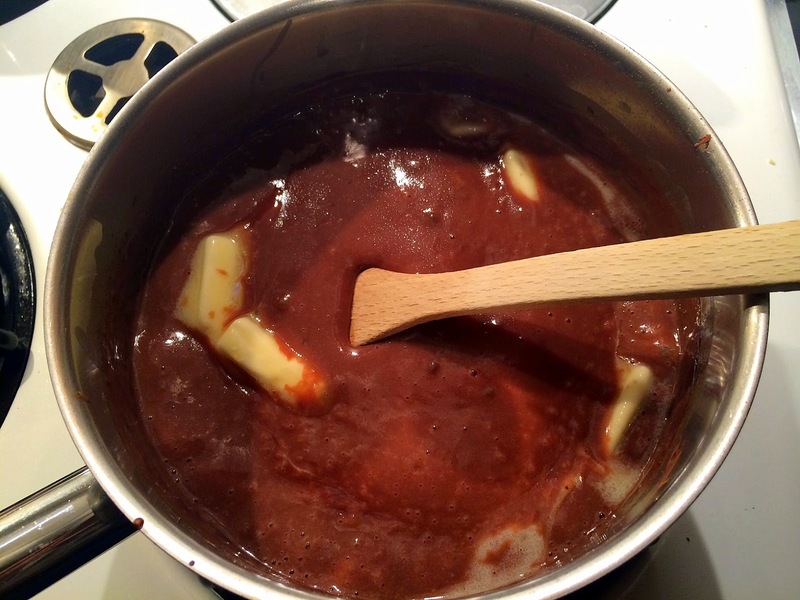 Pour this back into the saucepan and cook until a bit thicker. 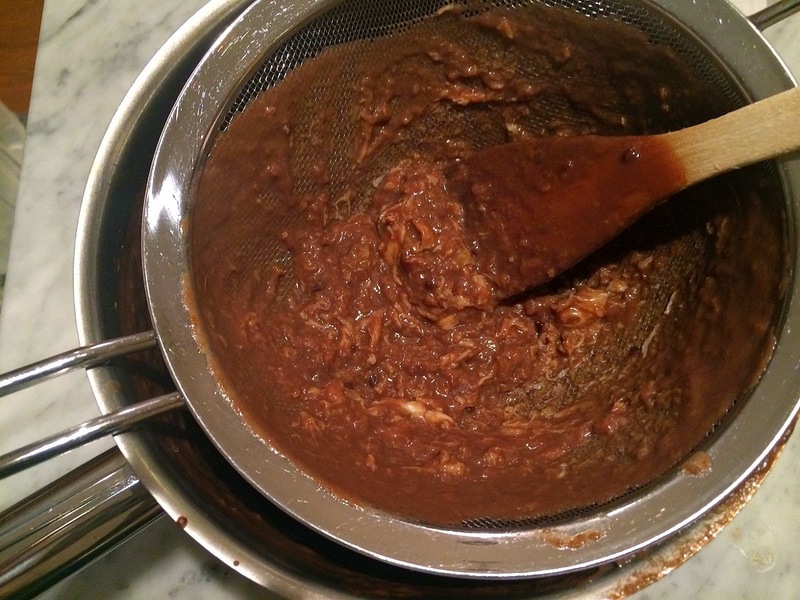 Pour through a sieve (to ensure there are no lumps) and into a bowl, ramekins or whatever and place in the refrigerator for at least four hours. 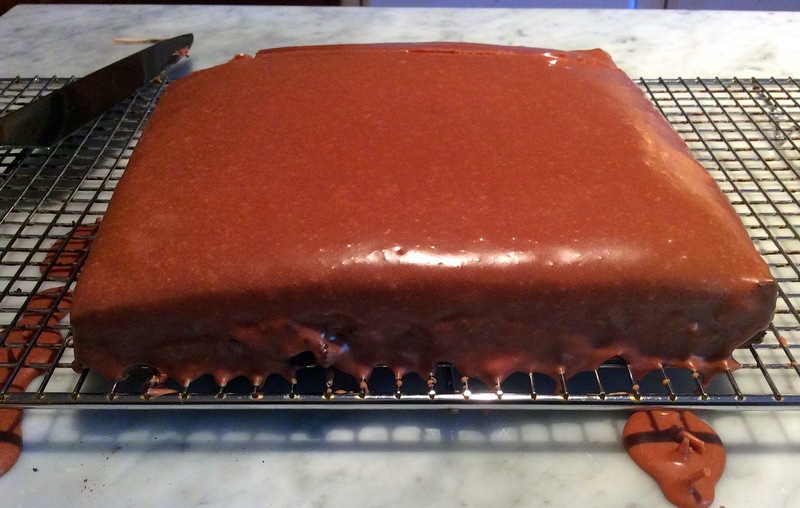 If you don't want a skin on your pudding, place plastic wrap directly on the surface. Serve plain or with a dollop of whipped cream. And enjoy a taste of your childhood. 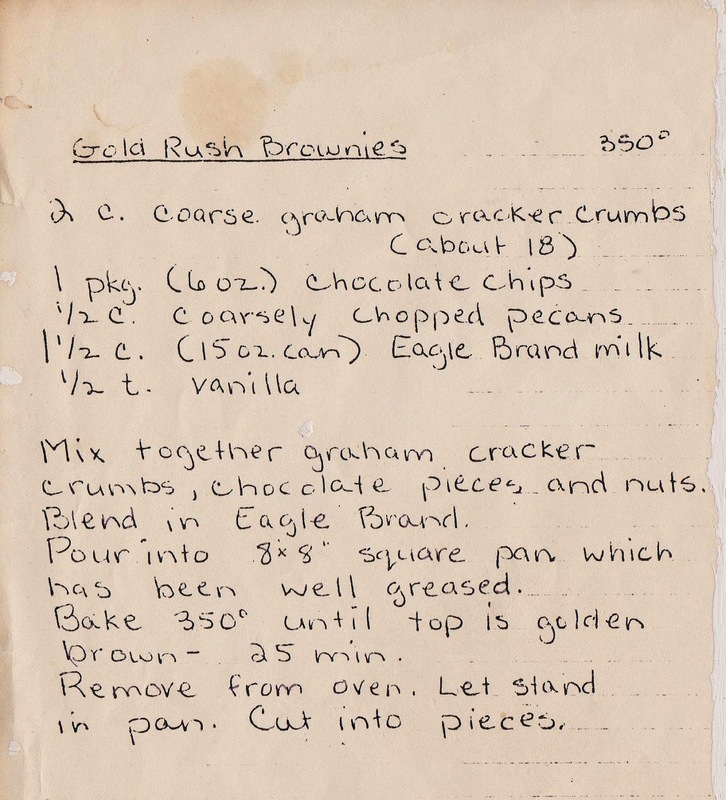 The Gold Rush Brownies recipe is from a Texas family's collection, purchased recently on eBay. 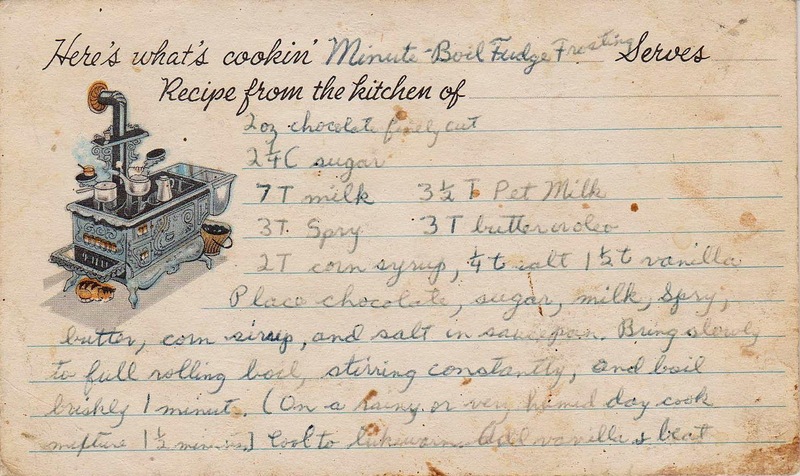 The recipe itself originally appeared on a can of Eagle Brand Sweetened Condensed Milk in 1951. (My local bodega carries Magnolia brand.) 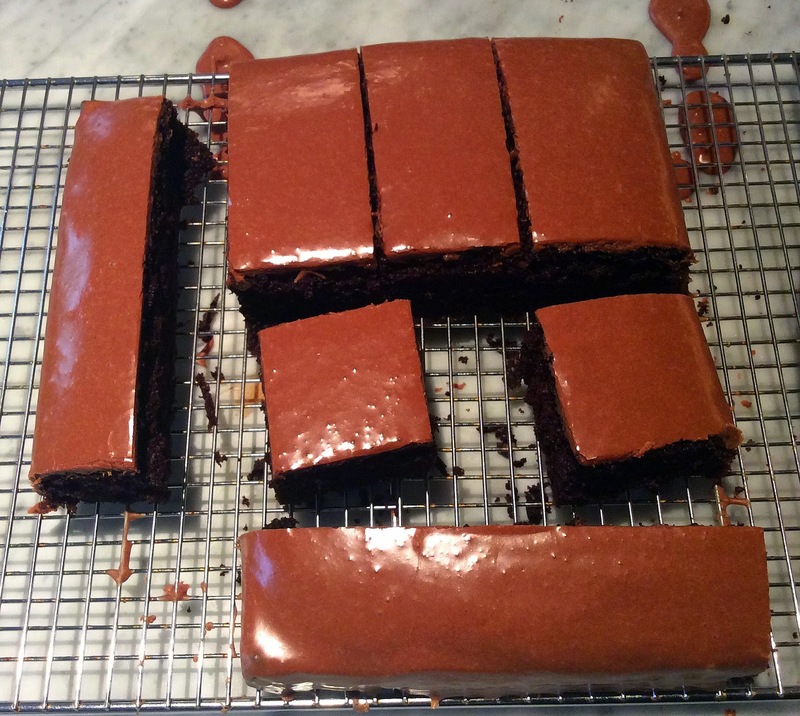 It's as easy as it is sweet and the brownies are even better the second day. Below are all the ingredients required. Notice the lack of butter and eggs. 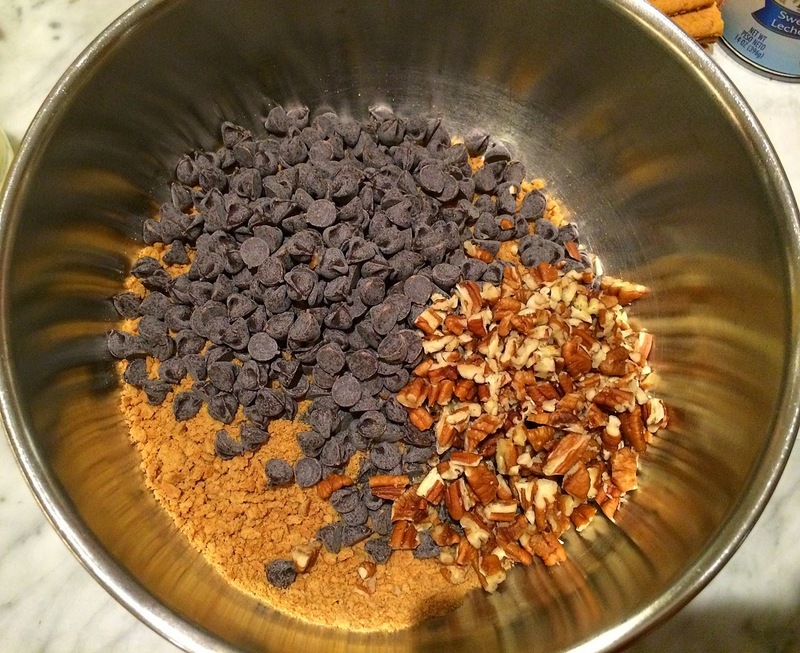 Place the chocolate, pecans and graham cracker crumbs in a bowl. 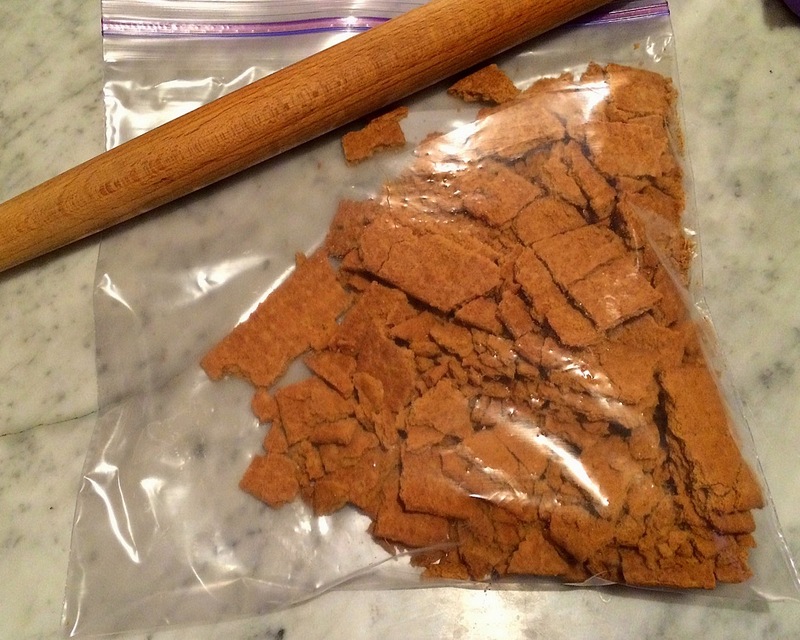 You can crush the graham crackers in a food processor or sealed plastic bag, using a rolling pin or wine bottle. Pour in the sweetened condensed milk and combine. The batter will be sticky! 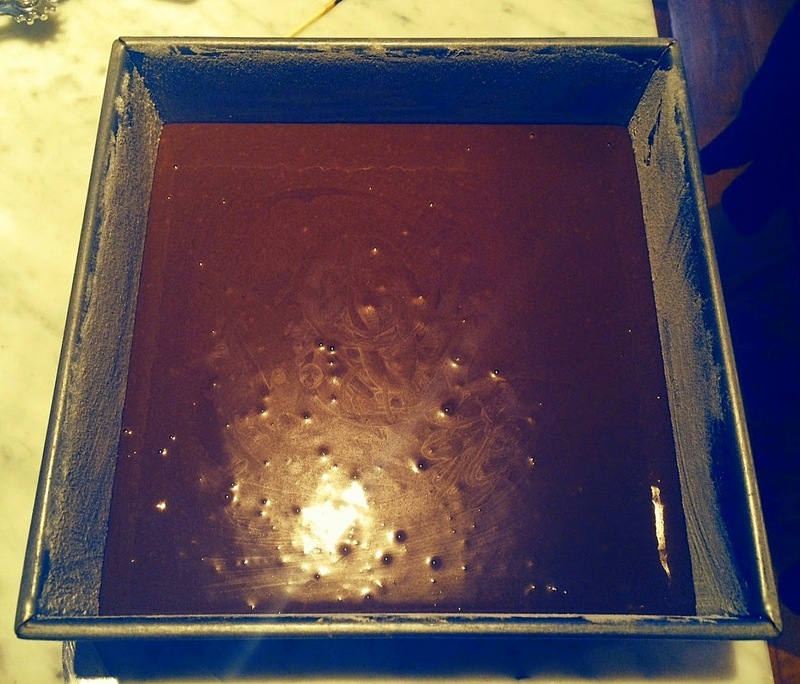 Spoon into a greased (or parchment-lined) 8 x 8 inch pan. 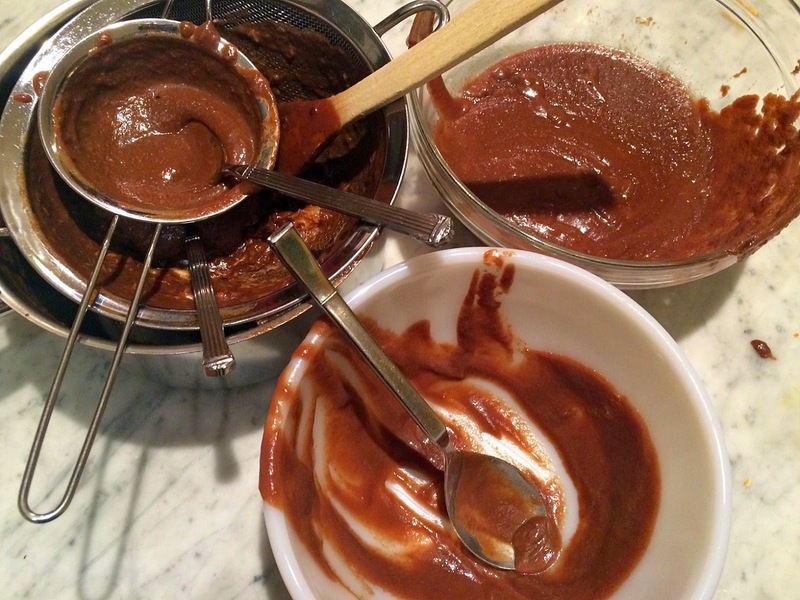 You can use a spatula, spoon or knife to spread the thick batter evenly. I put on non-latex gloves and used my hands. Bake for about 25 to 30 minutes until the top is golden brown. Production notes: I followed this exactly, except baked it for closer to 35 minutes. 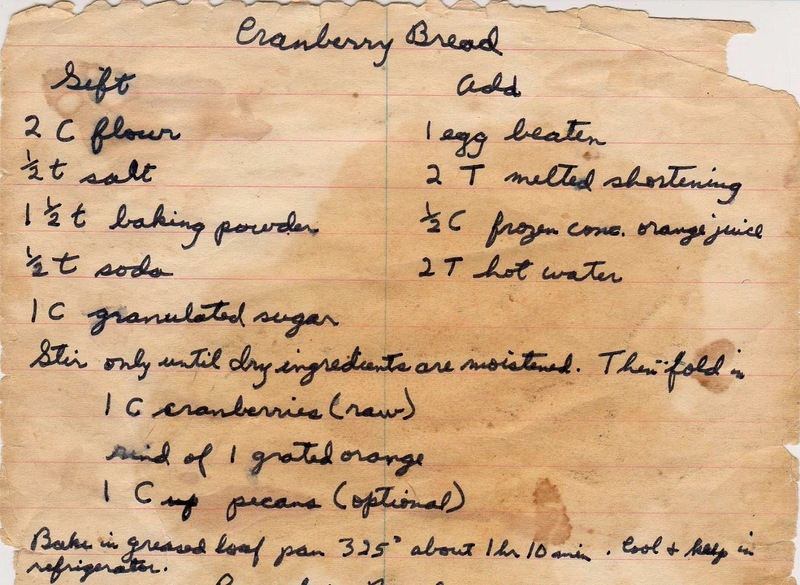 I've had a love affair with cranberry bread -- that enticing contrast between the tart berries and the sweet bread -- ever since I made it decades ago from Recipes for a Small Planet. 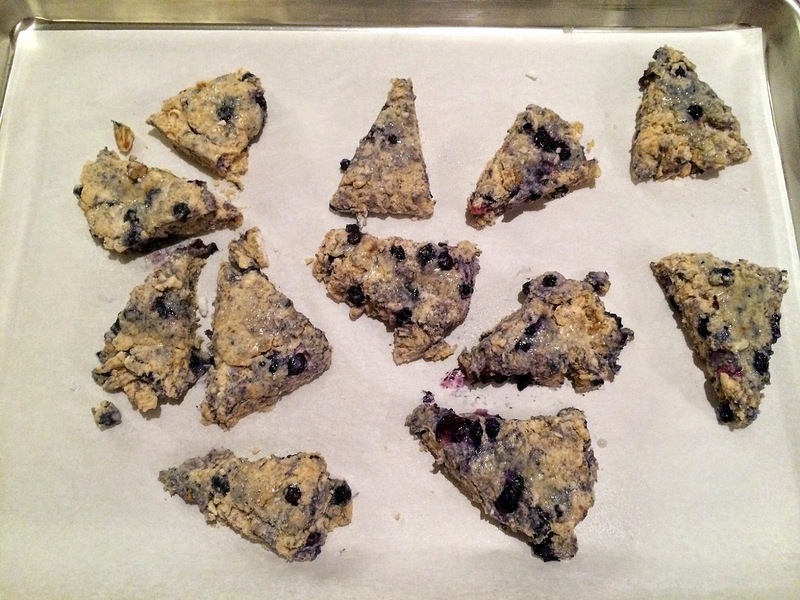 That healthy cookbook recipe used whole wheat flour, milk powder, etc., to presumably make it more nutritious. 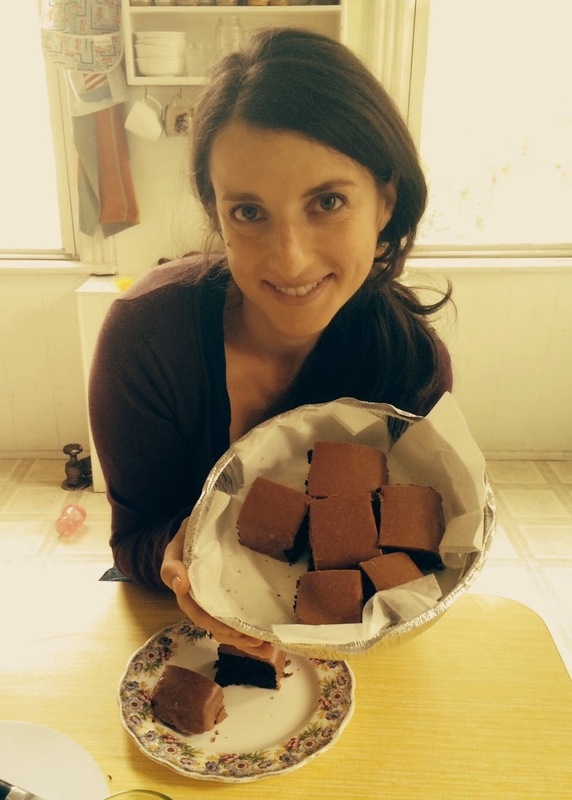 I've since given up on baking for health (why bother?). 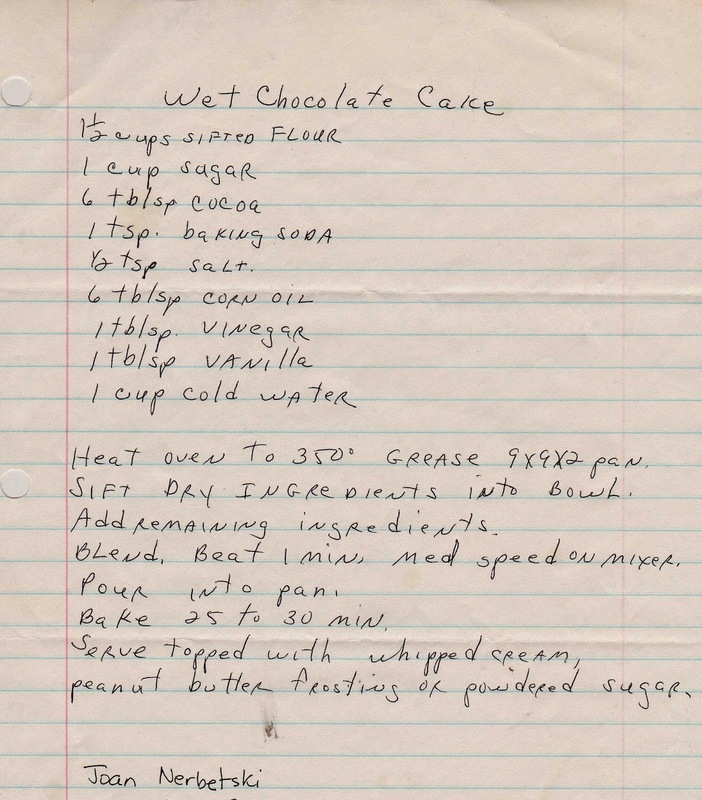 This wonderful recipe is from a new collection from an estate sale near Dallas, Texas, (via eBay, of course). While I try to refrain from buying even more recipe collections (I have hundreds of recipes at home I've yet to try), in a weak moment I caved and bid on a binder full of recipes divided into three sections: Mom, Jennifre [sic] and Other. The cranberry bread is from Mom. This bread is quick and simple to assemble -- with delicious results. 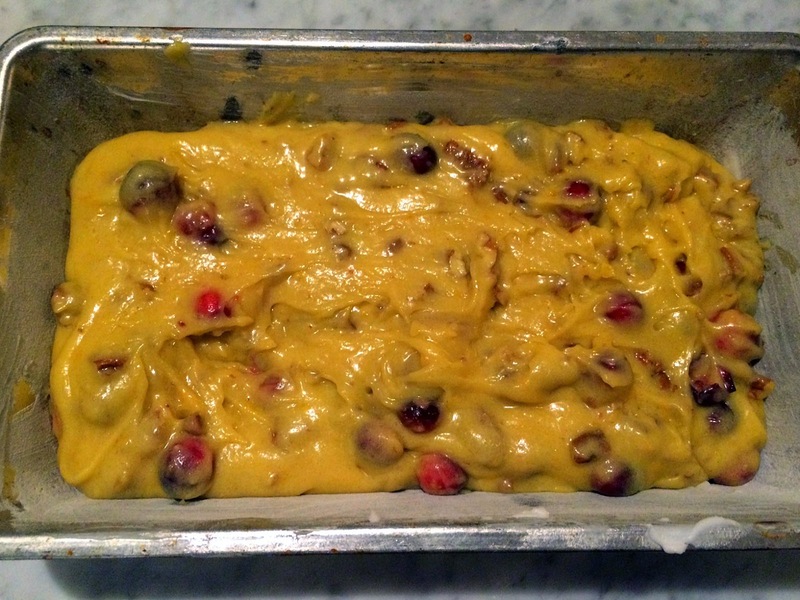 (It's also easier than another cranberry bread I made a while back, which requires an extra step.) 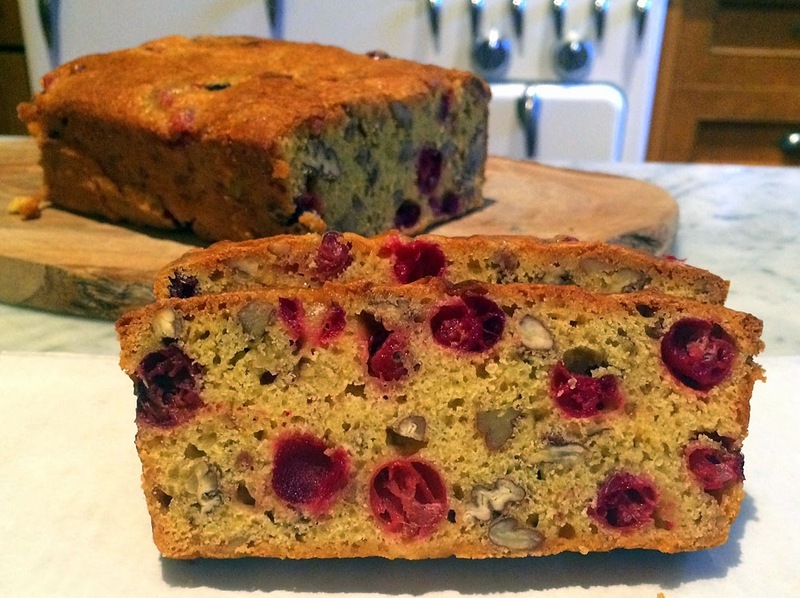 And with fresh cranberries literally flooding the markets (farmer's and super), now is the perfect time to make this. 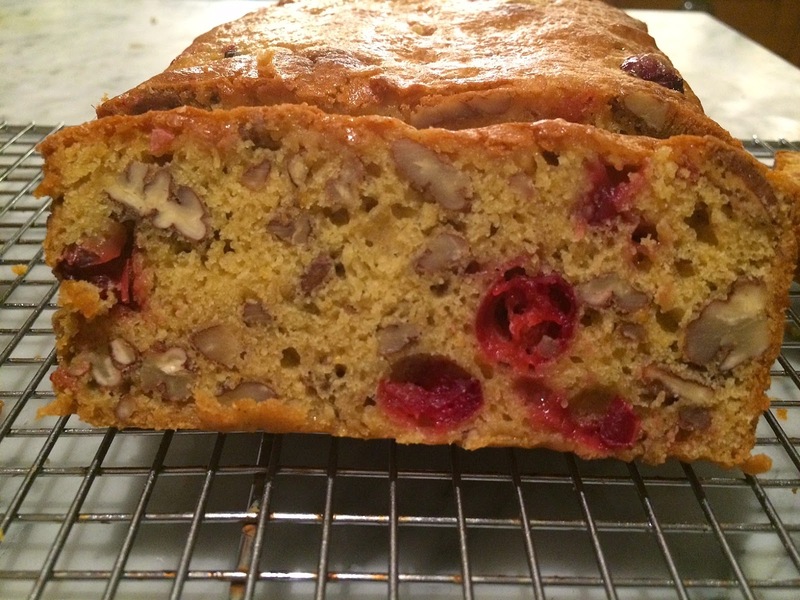 Cranberries, pecans and orange zest pack the flavor into this bread. 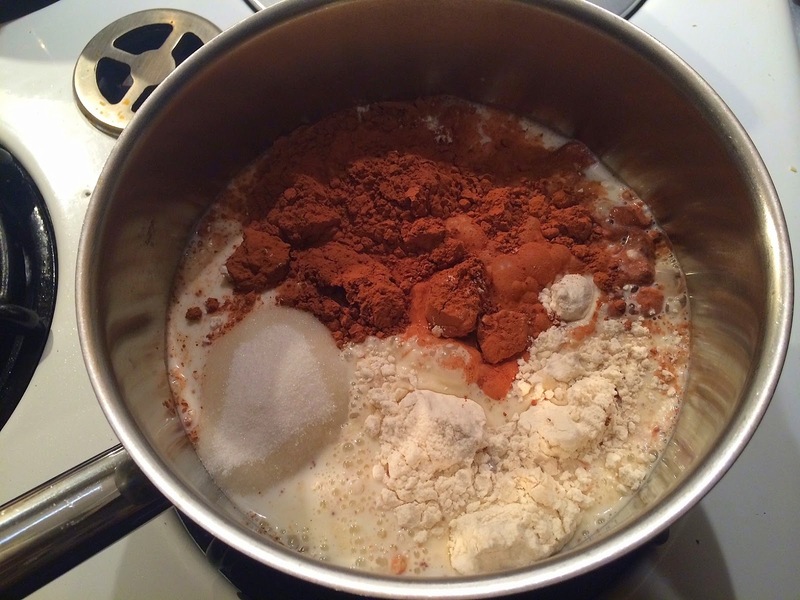 Mix the dry ingredients, add the liquid and mix just enough to combine. 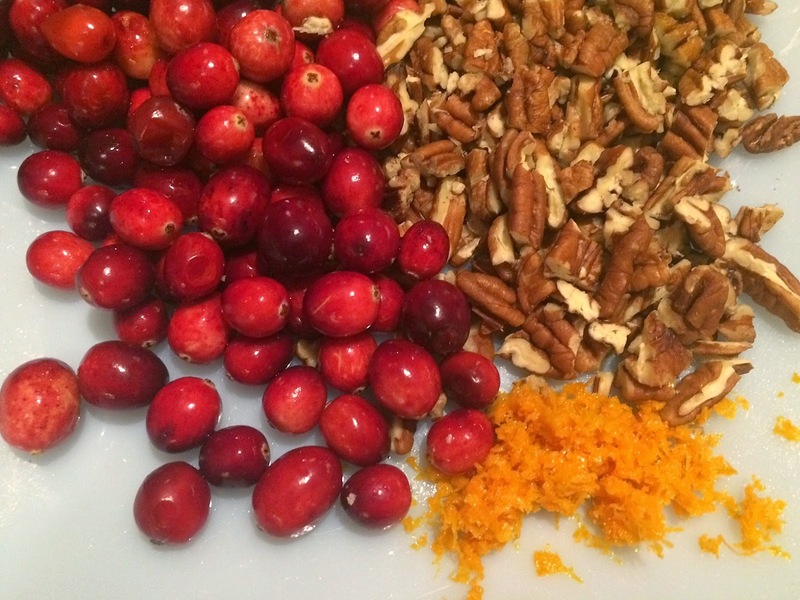 Add in the cranberries, nuts and zest and mix until evenly distributed. 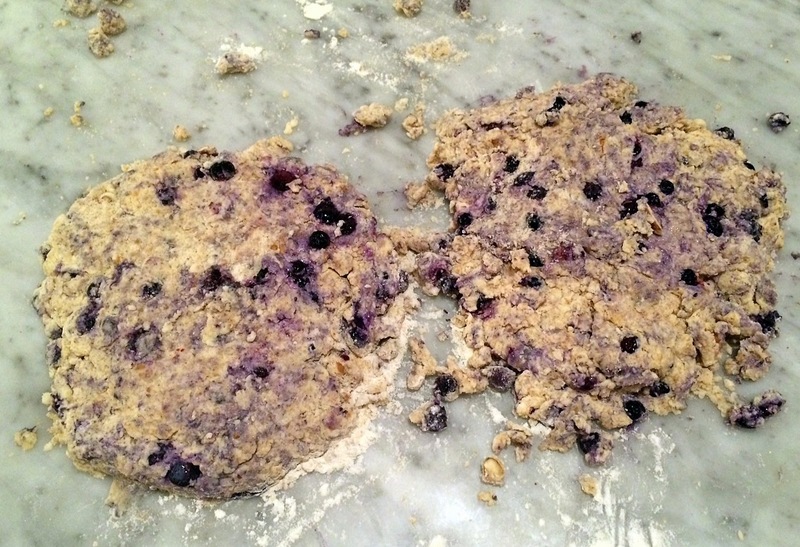 Spoon the batter into a greased and floured loaf pan and bake for about 80 minutes. Let the bread cool slightly, and turn out from the pan. 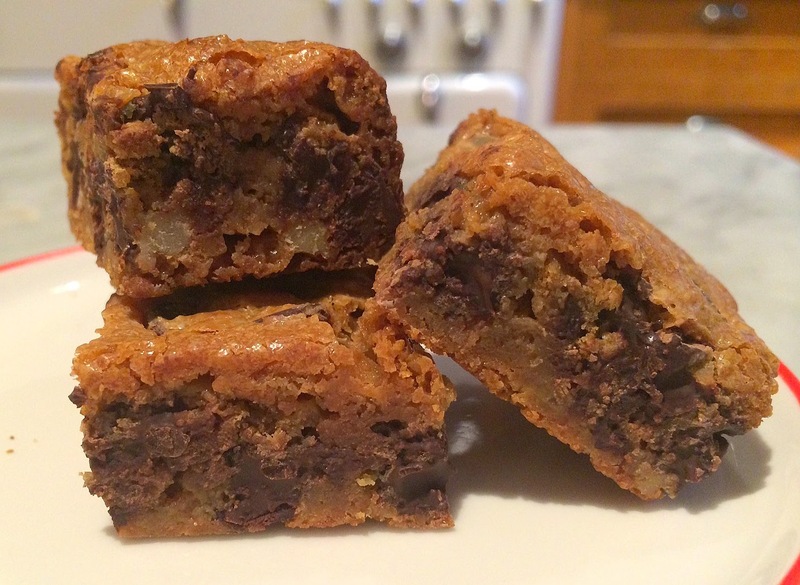 I followed this recipe exactly, right down to the baking time. 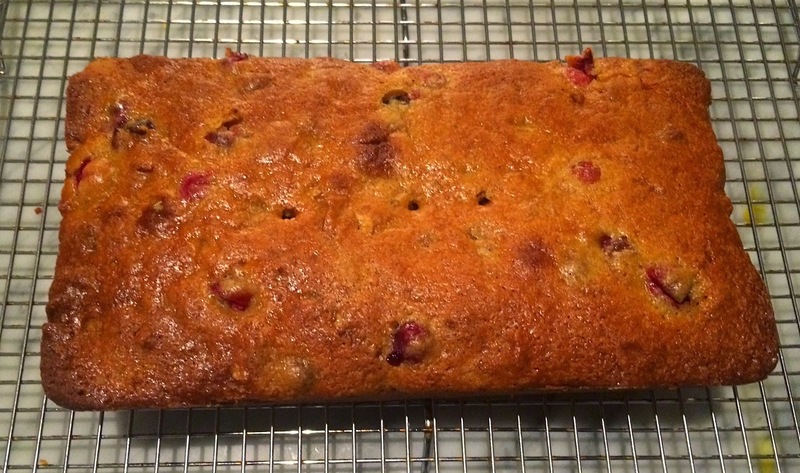 I used fresh cranberries from the farmer's market, but frozen would work fine too. I used butter for the melted shortening. The toughest part was finding frozen OJ in my neighborhood, where residents have an affinity for fresh-squeezed, organic and other manner of modern fancy juices. I also don't believe in refrigerating this bread, as the recipe author suggests. 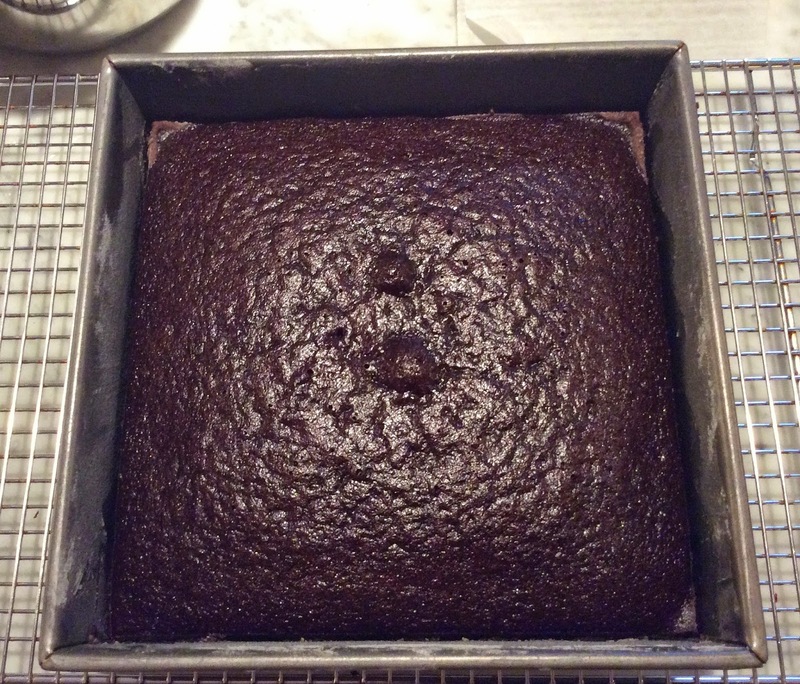 At 5:30 a.m. Sunday morning I baked a chocolate cake (don't ask) and it wasn't until it was in the oven that I realized, egads, it's vegan! No butter, no milk no eggs! 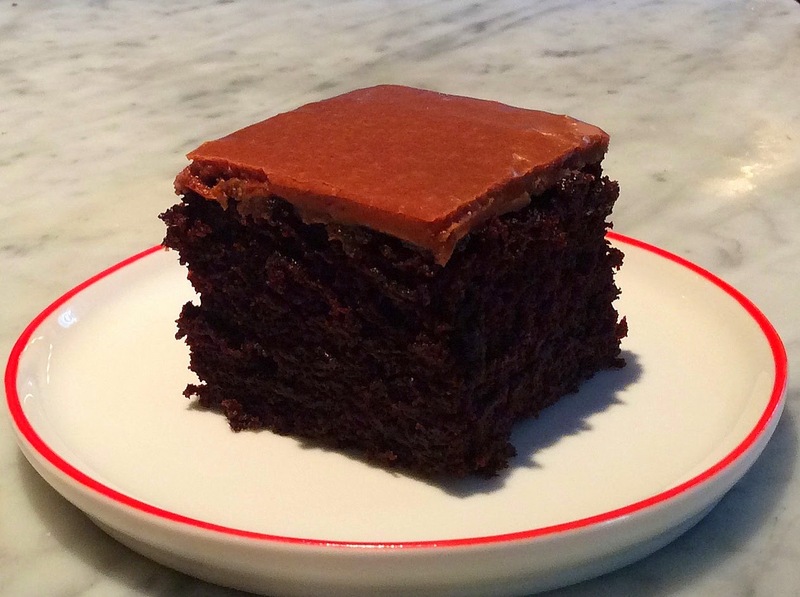 But fear not gentle readers, for Wet Chocolate Cake is a dark, moist delicious beauty that could not be simpler to prepare. 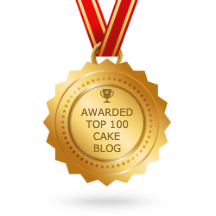 I served it to two people dear to me: My new SIL, who said, as he wolfed down his second slice, "It tastes like regular chocolate cake!" And my friend Jordana, who also enjoyed two slices (and didn't share even a bite with Arno, her sweet and adorable 16-month-old son). Having failed miserably last Thanksgiving preparing a vegan pumpkin custard dessert for my BIL, I was loathe to try another vegan recipe. I didn't give it a second thought, however, because most vintage recipes are decidedly not vegan. However, this is from a collection I recently received from Arthur Schwartz, who apparently had an on-air discussion about eggless cakes. 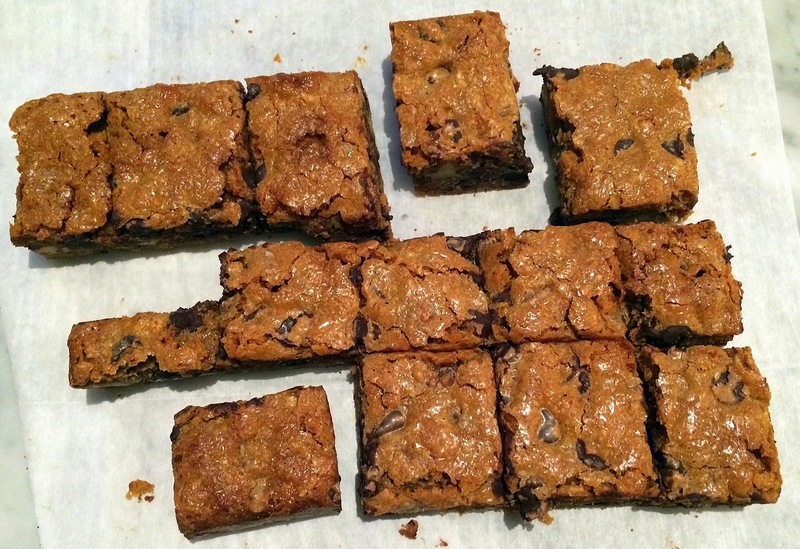 Which resulted in devoted listeners sending in dozens of such recipes -- this is by far the best of them. Start by sifting the dry ingredients into a large bowl. 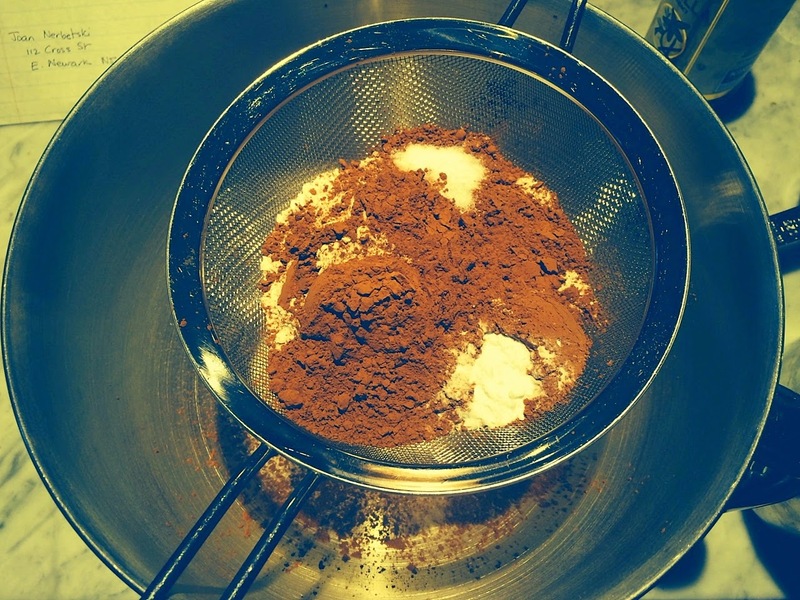 Mix the liquid ingredients together, pour into the the dry ingredients and blend for about one minute. 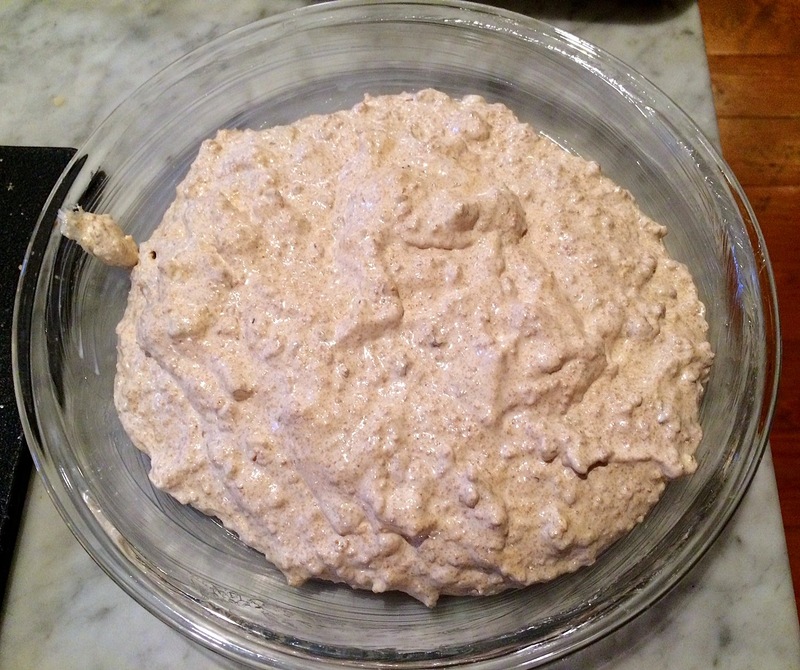 Pour the batter into a greased and floured pan. When slightly cool, run a butter knife along the edge and turn out. 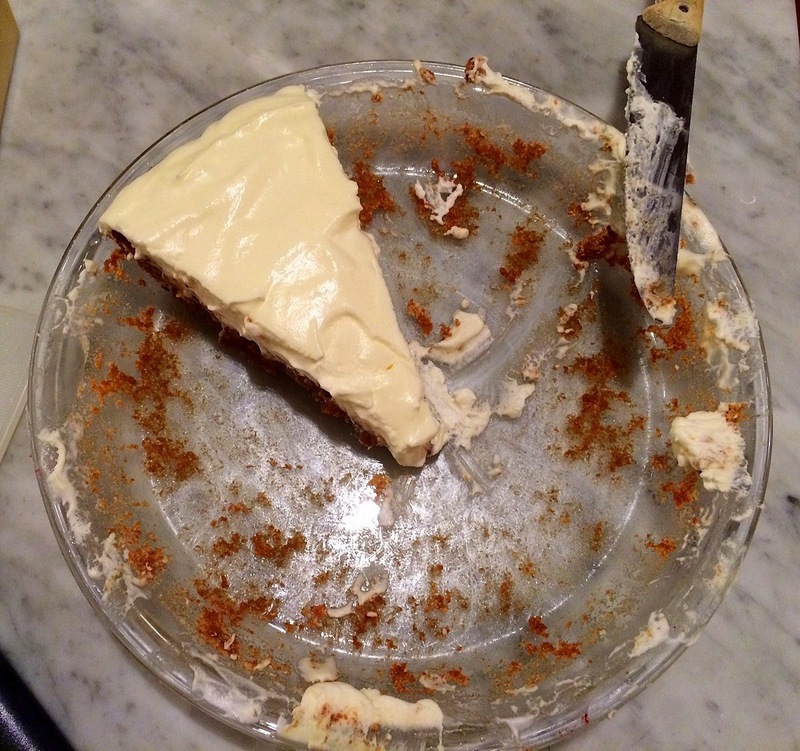 As you can see below, some of the cake remained in the pan. 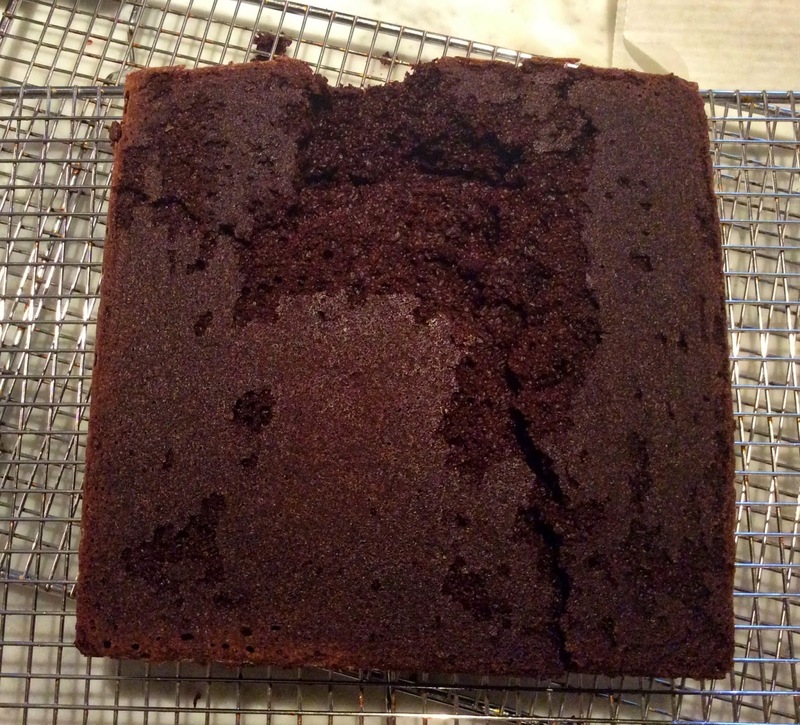 I just patched it up, flipped the cake over, frosted it and no one was the wiser. Production notes: I followed this recipe exactly as written. 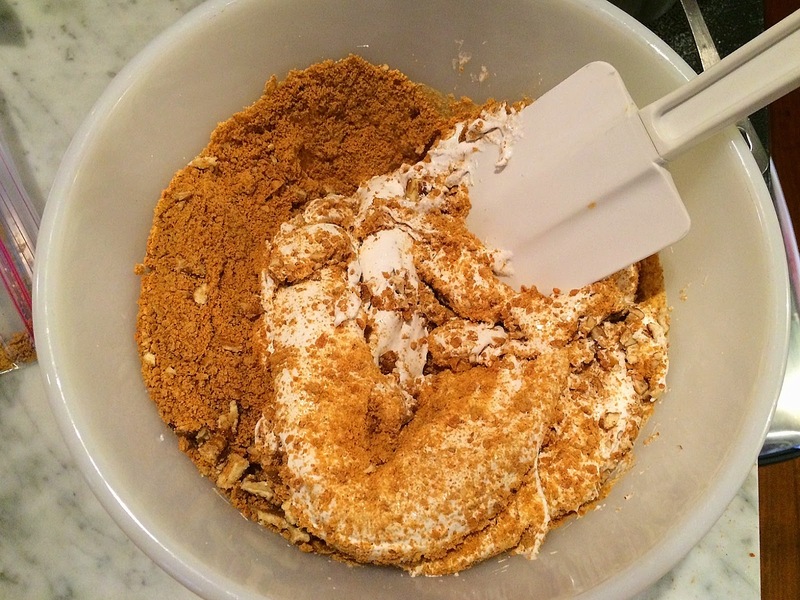 Chop and combine with the sugar and other ingredients. Stir until it comes to a rolling boil and let it rip for one minute. Let cool, add vanilla and beat.